In this chapter, I explore the much understudied realm of Holocaust animations. Here, I focus on the relationship between non-human and human agents both within the films, and through the spectator’s engagement with the film. I am interested in the ways tangible, yet nonorganic lines, marks and things can encourage the contemporary spectator to feel affects such as trauma and destruction related to the very human experience of the Holocaust without allowing the spectator to believe they can vicariously witness the specific trauma of any individual, who experienced this past first-hand. I also critically engage with the relationship between subjectivity and media testimony. I explore how both Silence (Sylvie Bringas and Orly Yadin 1998) and Maleńka (Luboš Gregor 2012) flit between the objective and the subjective, questioning the significance of the latter to the perpetuation of memory through witnessing and testimony. Yet I also consider how the films challenge Deleuze and Guattari’s argument that subjectivity serves no purpose in the assemblage. This point of contestation is important in the context of Holocaust memory, I argue, because if we deny our own subjective agency within the assemblage, then we deny our ethical responsibility towards the process of remembering. 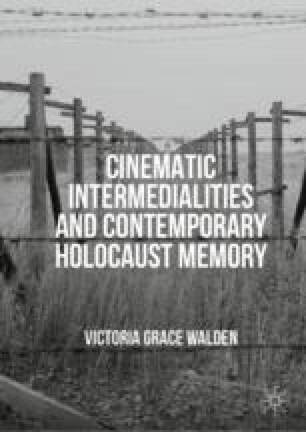 My analysis of Maleńka goes further into the ethics of Holocaust memory as it examines how the film invites us into an act of play, which inevitably leads to the creation of Auschwitz II-Birkenau. In contrast to the familiar notion of working through this traumatic past, I consider the significance of playing through to memory for nonwitnesses. Here, I question, how the film asks us to confront the difficult idea that any of us could potentially perpetrate violence.